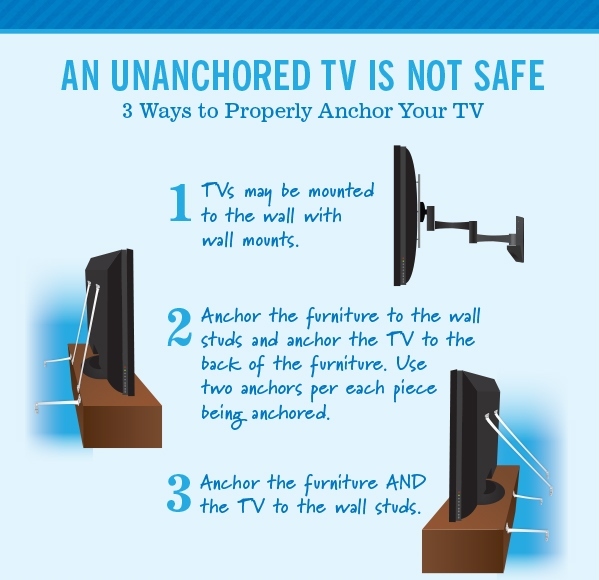 TV Safety – Don’t Forget to Anchor! Did you recently purchase a new TV to watch the big game? Both older CRT “tube” TVs and newer flat-panel TVs can be serious home hazards if not properly placed and anchored. All TVs in the home should be anchored along with the stands they are on. Use products specifically designed for television anchoring. Currently, TVs are not required to come with anchors but there are flat-screen TV anchoring products available. These products should come with an assortment of the required bolts that attach the anchoring device to the pre-threaded holes on the back of each flat-panel TV. Do not drill into televisions. 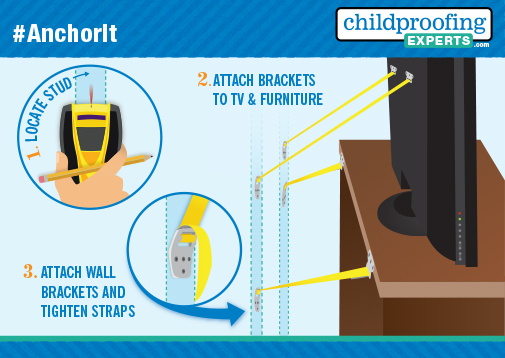 Safety straps designed for anchoring TVs can be used to secure a TV to the wall studs or to the back of a properly anchored piece of furniture specifically made to hold the size and weight of your TV. Another option for flat-panel TVs is to install wall mounts, which are secured to the studs in the wall. Whether installing TV anchoring straps or a wall mount, attaching the anchoring device securely to the wall studs with the appropriate length screws is critical for safety. Plastic hollow wall anchors will NOT be secure enough. It may be a good idea to hire a professional for installing a wall mount, especially if you have trouble locating the wall studs, there are concrete walls, metal surfaces or you encounter any other challenges. When using a TV stand or entertainment center, make sure to use an appropriate one that is designed to support the size and weight of the TV. The TV should be placed on a sturdy, low base and pushed back as far as possible. Even when using the correct stand or base for your TV, it should be anchored correctly. All cords should be hidden and secured so that children cannot grab or pull on them (to keep what’s attached to them from falling down on the child). Avoid placing any items on top of the TV that might attract a curious child, such as toys, games, DVDs, and remote controls. 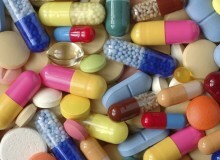 Remember, tip-over injuries are preventable. Even when supervised, curious or active children quickly find trouble. There are simple steps parents and grandparents can take to protect children. Anchor It! We recommend you recycle your older CRT “tube” TVs. Click here for TV Safety Tips in Spanish.